FILE RIO 2008 - March 1st.-31st., 2008, Rio de Janeiro, Brazil. 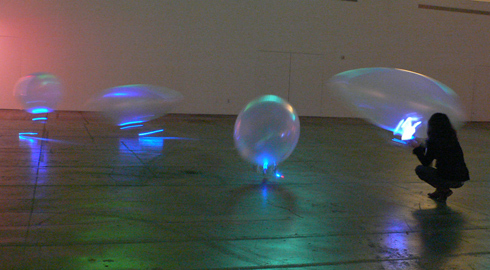 Exhibtion with ALAVs 2.0, Espaço Cultural Oi Futuro. 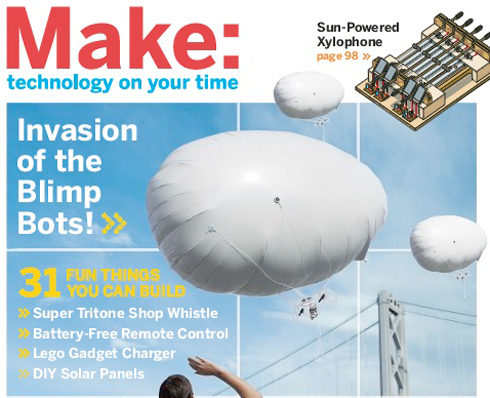 Cover of Make Magazine issue #12. VIDA 10.0 - November 9th, 2007, Madrid, Spain. 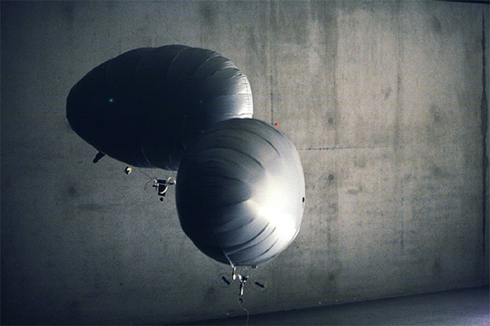 ALAVs 2.0 has been awarded with a Special Mention for the International Competition VIDA 10.0. You can vote for the Audience Award. Exhibited ALAVs 2.0 at Liberty Science Center. MAKER FAIRE AUSTIN - October 20th-21st, 2007, Austin Texas. Showed Blubber Bots. Travis County Expo Center. 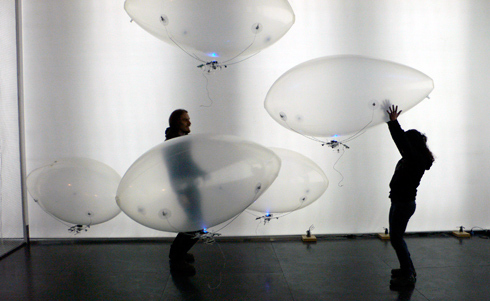 AER - Is an exhibtion at greenmuseum.org ALAVs 2.0 is featured in a group show curated by Andrea Polli, October 19th—, 2007. Invited to a 3 day festival, Robo [art]. An exhibition at Brandts, Denmark's Media Museum. ALAVs 2.0 received an honor for Aesthetics. BLUBBER BOT WORKSHOP - June 30th and July 14th, 2007, LA CA. 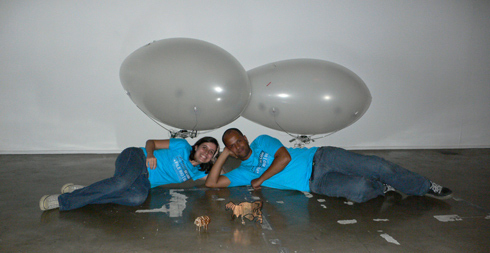 Taught one day workshops on building your very own Blubber Bot at Machine Project. SPARK AWARDS - June 10th, 2007 Art Center College of Design, Pasadena CA. I was ask to pull out ALAVs 1.0 for an after party. Built and demoed a flock of Blubber Bots for reboot 9.0, a community event for the practical visionaries who are at the intersection of digital technology and change all around us. MAKER FAIRE 2007 - May 19th-20th, 2007, San Mateo CA. Blubber Bots debut, we built a few over the weekend. Also the Maker Faire Store had Blubber Bot Kits available. FAMILY DAY -April 21, 2007, Irvine CA. OCMA - April 17, 2007, Irvine CA. ALAVs 2.0 made an appearance at the Orange County Museum of Art. ALAVs 2.0, BEALL CENTER - April 3 - June 9th, 2007, Irvine CA. 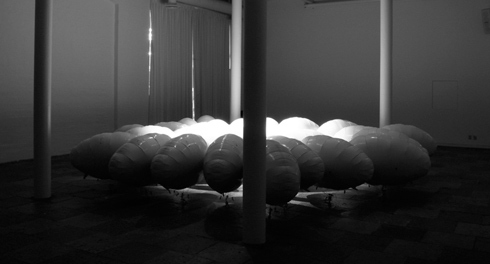 Selected for the Beall Center for Art and Technology's 2007 "Emerging Artist" series. 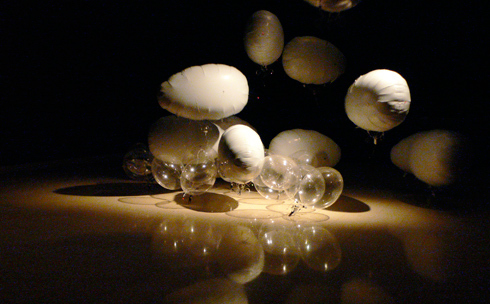 ALAVs (2.0) will be on exhibit in a solo exhibition from April 3 - June 9th, 2007. The ALAVs 1.0 was featured on the Discovery Network's Beyond Tomorrow. Beyond Tomorrow is a global cutting-edge television series covering technological innovations and breakthrough scientific advancements that are destined to change the way we live. A cast of reporters travel the globe, informing viewers on a diverse range of subjects including medicine, aviation, computers, space, agriculture, transport, architecture, energy, environment, sport, leisure and adventure. This series looks into our future to see what is now within the realm of possibility. Episode 46 covered the Maker Faire in California and included coverage of the ALAVs 1.0. It has already aired in some parts of the world, but look out for it later this year in the US on the Science Channel. Presented a few projects at the Make Magazine issue #7 (backyard Biology) Launch party. Lecture and launch party. The ALAVs made another appearance for a children's robotics class taught by Syuzi Pakhchyan at Art Center. 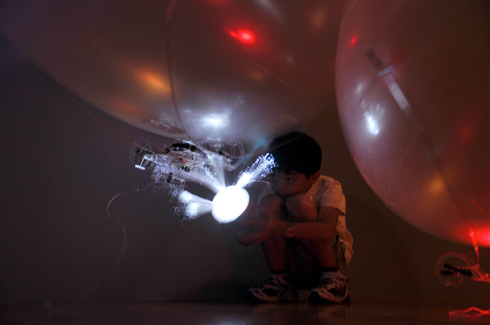 At the Maker Faire, the ALAVs (blimp whales) captivated the kids in away I could not have imagined. I had the opportunity to refine my shepardding skills over that weekend. Some of the more notable attention came from Dave Lowder at Beyond Productions. They spent about 3 hours filming with the ALAVs for a science & technology program called Beyond Tomorrow that airs on Discovery Network worldwide. I also was interviewed by Jay Leno's film crew for the Tonight Show. I was asked to sign a release from but was not told when the show might air. I will post updates as I find out more. Due to the constant flurry of activity, I really didn't have a chance to document all the fun. If you have any good photos and especially videos you would like to share, please get in touch! This project was produced in the Art Center Graduate Media Design Program, first presented in :"The New Ecology of Things".The event consisted of a group of representatives and engineers from Sun, faculty, students and the public. The project was well received. Below are few images.